Okay, stop right there. I know what you're thinking. Didn't I say last month that the Speculative Spotlight feature was going to be posted on the last Monday of the month? And don't I still owe you a Tropes entry this month, as well? Well yes, I did. And yes, I do. But I have a fickle heart and this is my party. I can do what I want. Actually, the reason I'm posting it early is because I've decided to move the feature to the second Monday of the month, which actually works perfectly for the subject of this month's entry. I was lucky enough to get my hands on an advance reader copy of Unidentified Funny Objects, a speculative humor anthology due for release on December 17th (next Monday). "A good humor story is hard to find." So says editor Alex Shvartsman in the foreword to Unidentified Funny Objects. And where science fiction and fantasy is concerned, I can't help but agree. 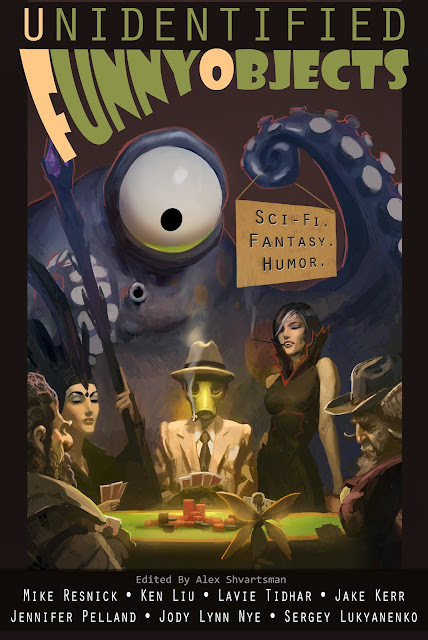 While some of the most popular genre works of all time have been filled to the brim with humor, from Douglas Adams to Terry Pratchett, opportunity for authors of such work in the short fiction space is lamentably slim compared to the usual speculative fare. There are a handful of quality publications that are open to lighter stories, but most professional markets prefer the serious stuff, and that makes it tough to find a home for these kinds of stories (as I'm learning from my own experience). With this anthology, UFO Publishing is stepping in to help fill a bit of that void, showcasing twenty-nine stories of a funny, speculative bent. I've been yearning for quite some time to see a wider reception to humor by those who hold the reigns in speculative fiction, as both a reader and a writer. That being said, I completely understand why so many markets and anthologies out there seem reticent to open their arms very wide. Humor is always going to be a gamble of sorts due to its extremely subjective nature, especially when it comes to the written form. That can make it pretty tough to nail down in such a way that everyone who picks up the book will find something they enjoy. But Unidentified Funny Objects manages to pull it off using the collaborative strength of variety. A quick glance at the table of contents makes that variety apparent, as you'll find work from award-winning veterans like Mike Resnick, rising stars like Ken Liu, and fresh names like James Beamon. The array of stories within ranges from the wacky to the witty in an effort to hit your funny bone from all angles, and the kitchen sink approach works. While I can't say I laughed aloud at every turn of the page, pretty much every story got at least a few grins out of me, and many of them go beyond giggles and well into compelling territory. My favorite story (though it's a tough call) might be The Alchemist's Children by Nathaniel Lee, in which a young girl treks through an enchanted forest to find her alchemist father, her scientific disposition clashing with the fantastic particulars of the journey. But that's just one example of what you'll get in this anthology. You're also going to find time traveling belly dancers, lunar Nazis, naked werewolves, and Santa Clause with a shotgun. "Quality over quantity" is a maxim oft repeated by those who toil at something worthwhile, but UFO delivers on both fronts. If you like science fiction and fantasy, and you like to smile, I say give it a shot. If enough of us do, it might become a yearly anthology, and that's something I would love to see. Unidentified Funny Objects comes out next Monday, but you can preorder an ebook or paperback copy now. You can also read a few stories for free on UFO Publishing's website. I'll have to pick up a copy! Nice! Hope you enjoy it as much as I did, Alex. A good humor story IS hard to find. Thanks for sharing this. I look forward to next week. Glad to share, Lucie. Hope you like it. Sounds like something I would love, and generally speaking, I tend not to read anthologies. It might be up your alley, Misha. Perhaps give some of the free stories on their website a read and find out? Oh, I do love me all things funny. Gonna have to check this out! Hope you like it, Randi! Thanks for stopping by. Great lineup there, with more than a few familiar names -- can't wait to check it out. Option A asks you to exercise a plan exercise regarding your future career goals. once characteristic your immediate post-MBA career goal in best essay writing service online one, wherever are you able to see your long career evolving? once more, each trajectories ought to be logical. as an example, if you worked as Associate in Nursing analyst in finance before your master's degree, and decide to add personal equity post master's degree, maybe you see yourself as a partner in your letter of the alphabet firm as your 1st path, or in operation an organization as your second path. every might unfold relying upon the alternatives you create or opportunities you see as you interact actively along with your career.